Our client, Reputation.com wanted to educate healthcare clients on how their reputation affects their business and new patient acquisition. We created a highly personalized campaign focused on the theme “How Healthy is Your Online Reputation” and created a dimensional direct mail campaign that included a personalized report on their institutions’ online health. And, a fantastic offer to receive a Fitbit 2 for attending a demo showing them more detail on their online ratings and how Reputation.com can solve their reputation problems. 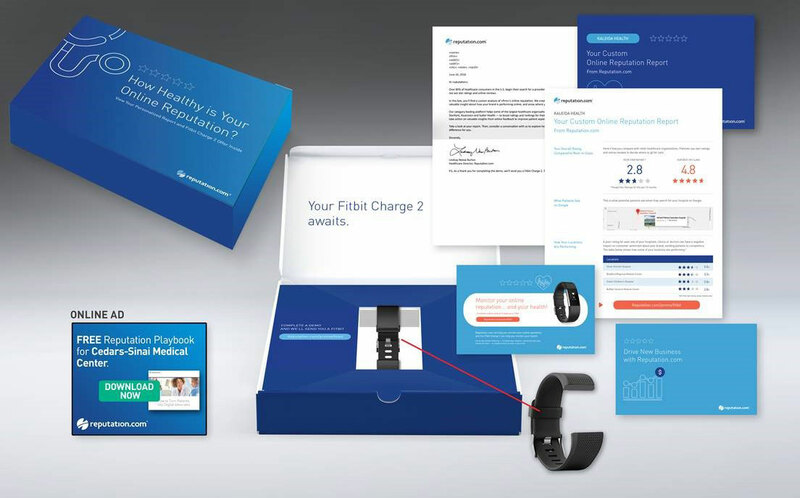 A Fitbit watch band was included in the box to exemplify this offer was waiting for them, i.e. here’s your Fitbit watch band, just attend the demo and you’ll receive the Fitbit 2 to put in the band. The dimensional direct mail campaign was followed up by several email, display ads and sales calls. Start meeting the clients you want. Speak with a Beasley dimensional direct mail campaign expert now. Get your free consultation. 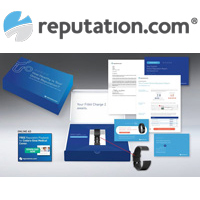 We created a highly personalized campaign focused on the theme “How Healthy is Your Online Reputation” and created a dimensional direct mail campaign that included a personalized report on their institutions’ online health and a fantastic offer to receive a Fitbit 2 for attending a demo showing them more detail on their online ratings and how Reputation.com can solve their reputation problems.